WE DONT SELL PUPPIES! WE CREATE COMPANIONS! 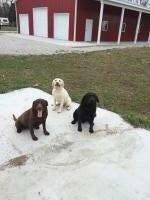 Here at our kennel we are not just a breeder of lab pups. We are trainers first and for most to provide you with not only a pup but offer our training service to help you get where you need to be with the addition to your family. Our goal is to show you the pups parents and their traits and trainability so you can have a better gauge to know what your pup may be. As said at the top we dont sell pups we create companions. We are not interested in selling as many puppies as we can! 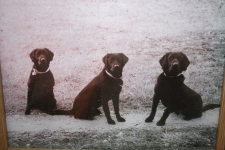 We are here to help you to have a well behaved lab and experience what many havent had in dog ownership. A dog thats not well behaved no matter what breed in my opinion is the number one reason for giving up the dog to a shelter.